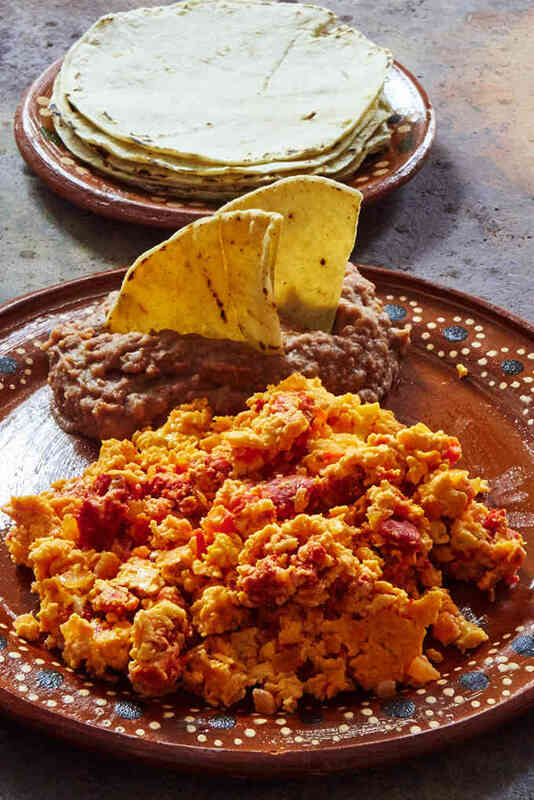 Scrambled eggs with chorizo (spiced Mexican pork sausage) served with a stack of hot tortillas and a great salsa is a favorite breakfast throughout Mexico. You can have it on the table in under 30 minutes. Our salsa verde and restaurant salsa are perfect accompaniments. 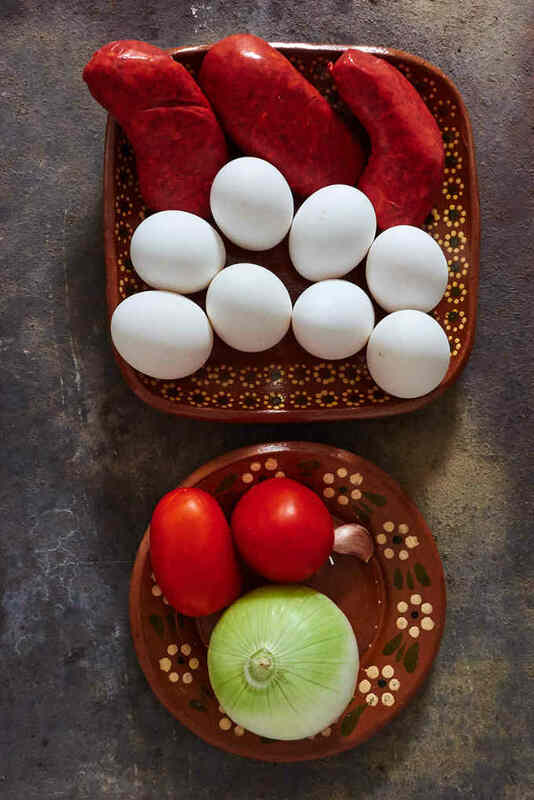 Start by gathering your ingredients: Mexican chorizo, eggs, tomato, white onion, and garlic. First, remove the membrane from the chorizo. Discard the membrane. 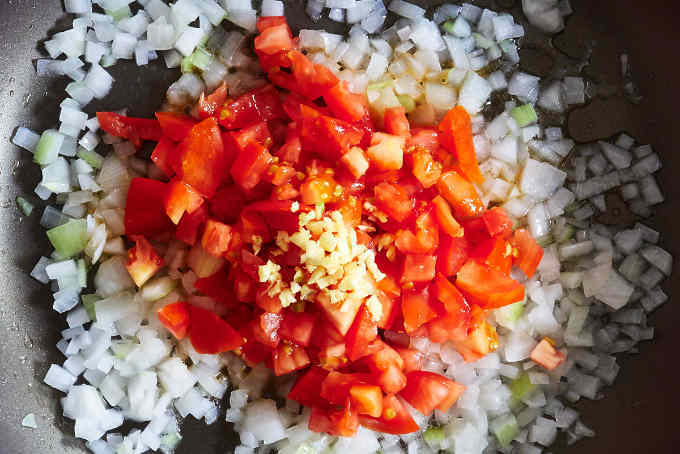 Next, finely chop the onion, tomato, and garlic. Preheat a large frying pan to medium hot. 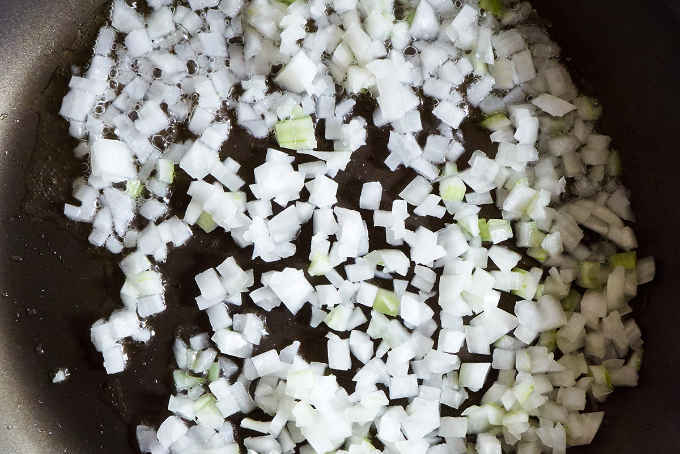 Add the cooking oil and the onion to the frying pan and cook for 1 minute. Add the tomato and garlic. Stir and cook for 1 minute. 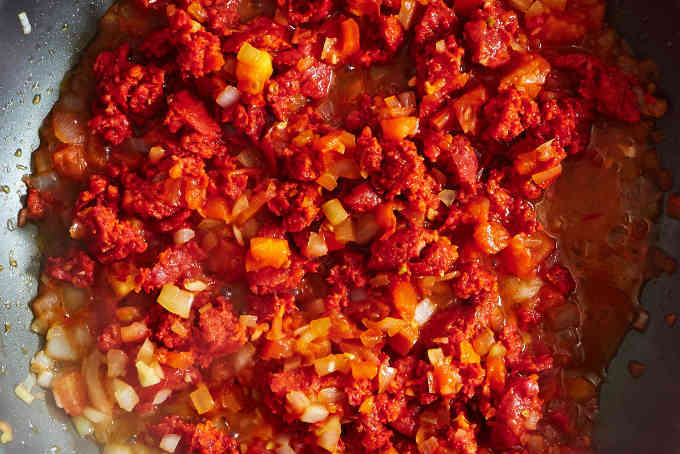 Crumble the chorizo into the frying pan with the onion, tomato, and garlic. Cook for about 5 minutes until most of the fat from the chorizo has cooked off. Crack the eggs into a bowl and then beat with a fork for 30 seconds. 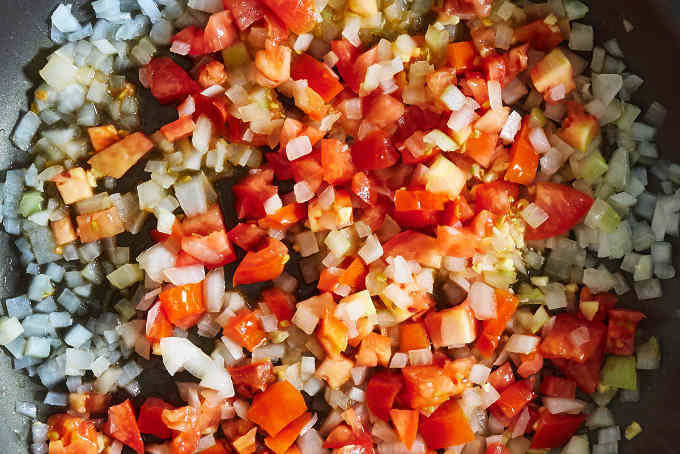 Pour the beaten eggs into the chorizo, onion, tomato, garlic mixture. Let the eggs set for about 30 seconds then stir with a spoon. Stir the eggs occasionally until the eggs are just cooked through. Don’t let the eggs brown. 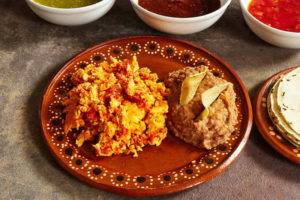 Serve with a stack of hot corn or flour tortillas, refried beans and the salsa of your choice. If you are a fan of flour tortillas, try making the Coahuila style whole wheat tortillas. 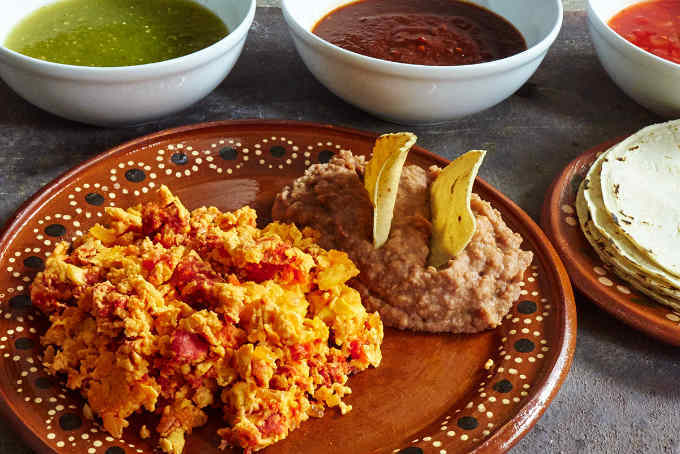 Scrambled eggs with chorizo served with a stack of hot tortillas and a great salsa is a favorite breakfast throughout Mexico. It's really easy to prepare and you can have it on the table in under 30 minutes. We love it as a start to our Saturday or Sunday morning. 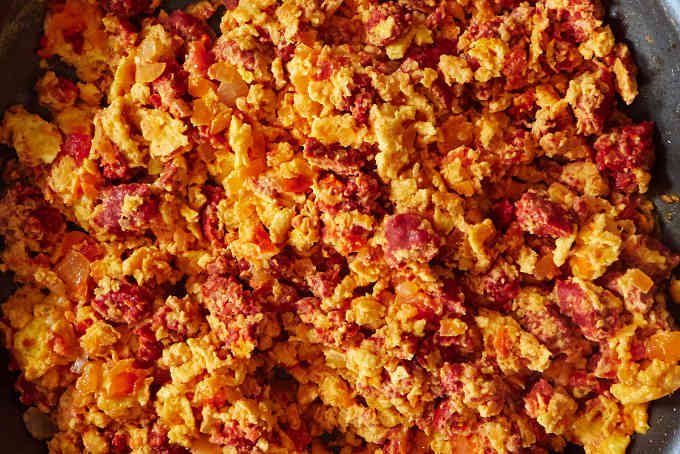 Pour the eggs into the chorizo, onion, tomato, garlic mixture. Let the eggs set for 1 minute then gently stir the mixture. 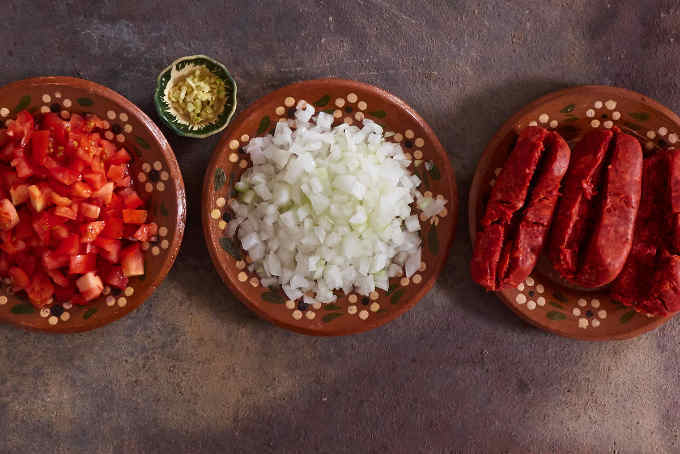 Chorizo is a seasoned Mexican style pork sausage available in most supermarkets. It is spicy but not hot. Each brand has a different flavor. Try a few until you find your favorite. You can substitute Soyrizo, a soy protein based chorizo if you want to reduce the fat in the dish. If there is too much fat remaining after cooking the chorizo for about 5 minutes you can drain the fat before adding the eggs. 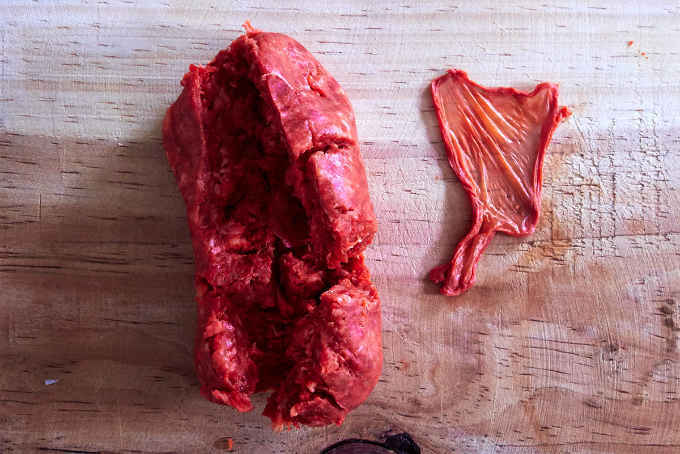 Mexican chorizo needs to be fully cooked before eating. 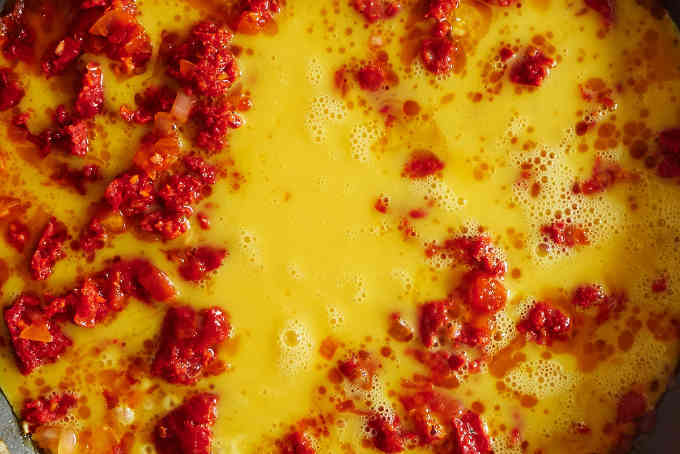 You can top your eggs with cheese if you'd like. Ranchero cheese is a good choice. Sounds delicious! I love me some Chorizo and eggs!! This was DE-LISH-OUS! I’ve never cooked chorizo before but will definitely make this again. I used beef chorizo and added cilantro to the recipe. MMmmmm! I love chorizo and eggs. The only kind of chorizo I can find is the one in the plastic tube (Cacique brand). I think the pork is the best flavor. I was taught to cook it about 20 years ago by a friend. I was shown a simpler recipe of just eggs, chorizo, and to mix in fried potatoes so that’s how I make it to this day. My mom taught me with the pork chorizo in the plastic casing as well(you just squeeze it out). My son LOVES potato and chorizo as well. Just cut the potatoes in to small cubes,. Fry them a bit with a little salt. In a separate pan, cook the chorizo, then add in the potatoes. Then there’s choriquezo, which is just chorizo and cheese. You cook the chorizo, then add in some shredded cheese(I use Monterrey Jack). It makes a great dip! Worked great with soy chorizo replacement. Just needed to add couple of table spoons butter when adding the chorizo to replace the natural oils. Amazing flavor, thank you for this!